v.delaunay - Creates a Delaunay triangulation from an input vector map containing points or centroids. A single vector map can be connected to multiple database tables. This number determines which table to use. When used with direct OGR access this is the layer name. 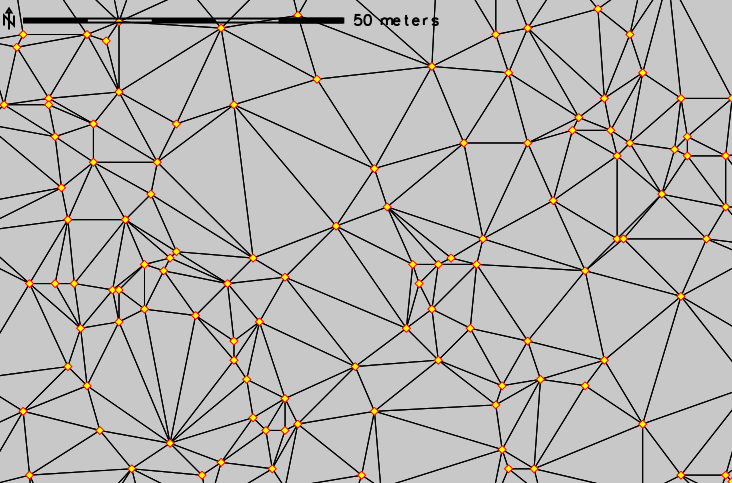 v.delaunay uses an existing vector points map (input) to create a Delaunay triangulation vector map (output). Commands used with the North Carolina dataset to create the above figure (subset shown in figure). Based on "dct" by Geoff Leach, Department of Computer Science, RMIT.